Can Tho (VNA) – Officials from Asia-Pacific Economic Cooperation (APEC) member economies expressed their special interest in Vietnam’s rice production and export during their fact-finding trip to the Cuu Long (Mekong) Delta Rice Research Institute (CLRRI) and Trung An Hi-Tech Farming JSC based in Can Tho city on August 24. At the CLRRI located in Ninh Kieu district, the delegates were briefed on the operation of the institute, which is the premier national institution specialising in rice research. 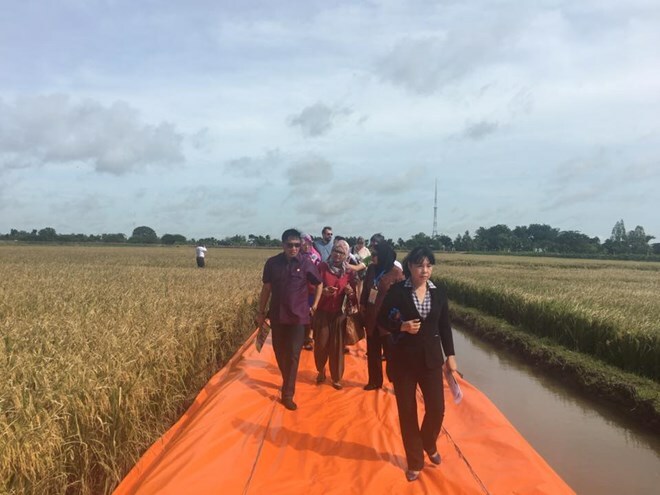 The institute has released more than 180 new varieties of rice with 77 varieties certified nationally, CLRRI Director Tran Ngoc Thach said, adding that about 25 new solutions have been developed and transferred to farmers. It has collaborated with a number of organisations and universities worldwide such as the International Rice Research Institute, the UN Development Fund, the World Bank and the UN Food and Agriculture Organisation, in terms of food security, poverty reduction and climate change adaptation and mitigation. Thach said the institute aims to move towards a more efficient and climate-ready rice production system in the time to come. Meanwhile, Trung An High-Tech Farming JSC has 20,000 ha of paddy fields which produce 400,000 tonnes of rice meeting GAP and organic standards annually. The company’s major rice export markets include the US, Malaysia, the Philippines, Singapore, China, Iran, Iraq, Germany, Italy, France and Australia, to name but a few. Gerald Herbert Smith, a US delegate, said that the increasing level of water and salinisation remains biggest challenges to rice production in Vietnam’s Mekong Delta region, especially at low-lying areas, requiring researchers and scientists to look for ways to ease their negative impacts. He said post-harvest loss is also a challenge to agriculture in general and rice production in particular, noting that the US and the Vietnam Ministry of Agriculture and Rural Development have engaged in joint studies and scientific collaboration in order to seek the best ways to reduce the losses. The official hailed the CLRRI’s plan to implement other production models like aquaculture apart from rice crops in the context of climate change. According to the Ministry of Agriculture and Rural Development, the Mekong Delta region has harvested 10,259 million tonnes of rice in the winter-spring rice crop in 2016-2017, up 188,375 tonnes from the same period in 2015-2016. The region cultivated more than 1.5 million ha of rice during the crop, down 22,630 ha against the previous winter-spring crop, with an average productivity of 6.7 tonnes a hectare. The ministry said in the rest of 2017, drastic measures will be taken to deal with unfavourable weather conditions and the impacts of climate change such as drought and saline intrusion. The region will plant over 1.6 million ha of rice in the 2017 summer-autumn crop, hoping to reach an estimated output of 9.45 million tonnes, up nearly 437,000 tonnes against the 2016 summer-autumn crop.